DEA agents Steve Murphy and Javier Pena visit Lincoln Theatre to share the true story of hunting Colombian drug lord Pablo Escobar. WASHINGTON — The hit Netflix crime drama series “Narcos” (2015-2017) chronicled the Drug Enforcement Administration’s determined hunt for Colombian drug kingpin Pablo Escobar, who at one point controlled over 80 percent of the cocaine shipped into the United States. 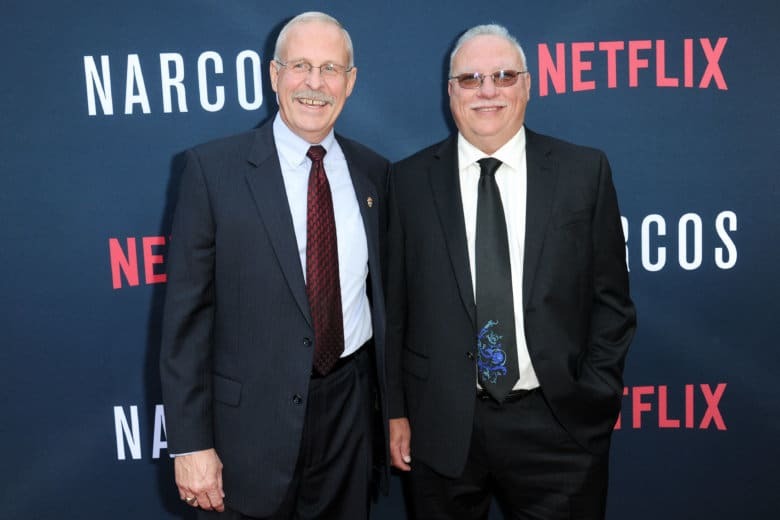 This Saturday, the two men who inspired the show, DEA agents Steve Murphy and Javier Pena, share what really happened in their stage conversation “Capturing Pablo” at Lincoln Theatre. What types of questions do audiences ask? Like most Hollywood adaptations, the show took some creative license. Still, Murphy and Pena worked closely with actors Boyd Holbrook and Pedro Pascal. After that, they drove down to Quantico to embed themselves with the DEA training class. Despite their behind-the-scenes work, Murphy and Pena refused to see advanced footage. Amid family life, Murphy admits being constantly consumed by the hunt for Escobar. In 1991, he and Pena relocated to Medellín, Colombia, where he was stationed for 18 months working the case alongside the U.S. Army’s Delta Force and U.S. Navy’s Seal Team Six. What were the scariest moments where he feared for his life? Finally, their breakthrough came with the raid on Escobar’s compound on Dec. 2, 1993. Bringing him down was a historic occasion. All these years later, what’s his take on Escobar the man? Murphy remains frustrated by various myths that have grown after Escobar’s death. He says the second myth is that Escobar was some sort of Robin Hood figure. He says the final myth is being spread by his son. In the end, he gives the credit to local forces on the ground.